“With our rich Hi-Fi heritage and legendary reputation for craftsmanship, Yamaha is changing the way people enjoy their music. 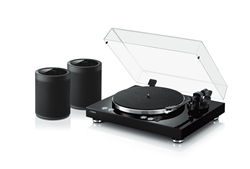 It’s been 30 years since we introduced a turntable and the MusicCast VINYL 500 reinvents the category,” said Robert Goedken, Yamaha. Today Yamaha introduced a new spin on a time-tested classic for the next generation of music enthusiasts: the MusicCast VINYL 500 turntable — a Wi-Fi, multi-room turntable that allows music fans to not only play their favorite vinyl albums but also stream their favorite tunes throughout their entire home from the same device. The Wi-Fi feature of the VINYL 500 makes its wireless capability stand apart from other products on the market. Through this feature, stereo setups are robust and simple to create — connect a pair of wireless MusicCast 20 speakers, or one or two MusicCast 50 speakers, to spin or stream music over a Wi-Fi network, no receiver necessary. For extra bass, add a wireless subwoofer to create a 2.1-channel setup. What’s more, Wi-Fi allows the VINYL 500 to expand a record’s reach beyond a typical single room setup to any room in your home by streaming its tunes to any MusicCast-enabled product. These stereo and multi-room configurations are all controlled by the MusicCast app. The wireless flexibility of the VINYL 500 gives music fans the freedom to place it anywhere in their home – without the dependency of connectivity to other stereo equipment. This wireless freedom allows the turntable to double as a statement piece, free to sit on display while retaining all of its functionality and connectivity. For the music you would rather stream than own, the VINYL 500 comes fully packed with wireless technologies, including Wi-Fi, Bluetooth®, Apple AirPlay® and Spotify Connect. It also supports numerous built-in streaming services, including Spotify, Pandora®, SiriusXM Internet Radio, TIDAL, Deezer, Napster and thousands of free internet radio stations, all accessible via the MusicCast app. Additionally, the VINYL 500 works with Alexa voice control via any Amazon Echo device for streaming music and controlling multi-room or stereo setups via spoken commands. Along with the VINYL 500, Yamaha is also releasing the TT-S303 turntable. A turntable created with the Yamaha heritage for Hi-Fi quality, the TT-S303 can be paired with MusicCast-enabled receivers to add whole-home vinyl playback. ∙ Cartridge – Moving Magnet cartridge for durability and high-output delivery. ∙ Built-in Phono Preamp for line-level or Phono audio outputs. lateral balance. Anti-skate and adjustable counterweight maintain stable tracking. motor with a durable rubber belt to achieve stable rotation. vibration. A piano black gloss finish reminiscent of Yamaha’s premier pianos. ∙ External DC Power Supply – Cuts AC electronic interference. The MusicCast VINYL 500 turntable (MSRP: $699.95) and TT-S303 turntable (MSRP: $449.95) will be available in September in a Yamaha piano black gloss finish. Yamaha Corporation of America (YCA) is one of the largest subsidiaries of Yamaha Corporation, Japan and offers a full line of award-winning musical instruments, sound reinforcement, commercial installation and home entertainment products to the U.S. market. Products include: Yamaha acoustic, digital and hybrid pianos, portable keyboards, guitars, acoustic and electronic drums, band and orchestral instruments, marching percussion products, synthesizers, professional digital and analog audio equipment, Steinberg recording products and NEXO commercial audio products, as well as AV receivers, amplifiers, MusicCast wireless multi-room audio systems, turntables, Blu-ray/CD players, earphones, headphones, home-theater-in-a-box systems, sound bars and its exclusive line of Digital Sound Projectors. YCA markets innovative, finely crafted technology and entertainment products and musical instruments targeted to the hobbyist, education, worship, music, professional audio installation and consumer markets.